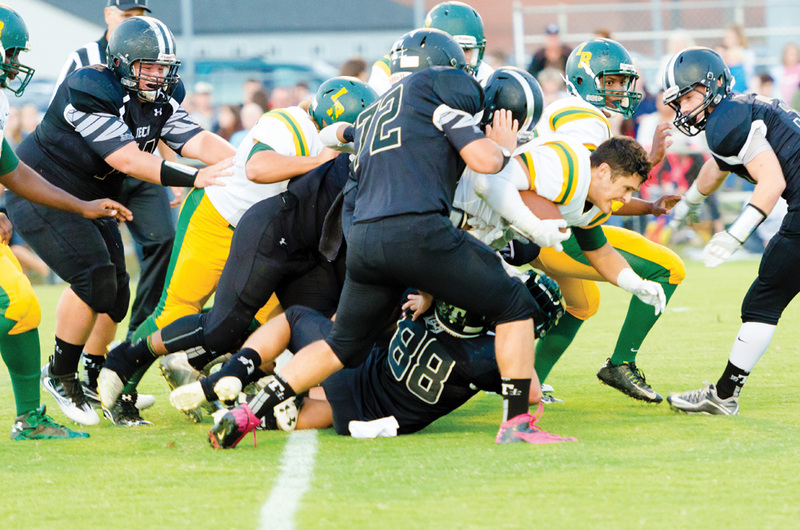 Indian River graduate George Martin powers through the defensive line, losing his helmet in the process, during a game two years ago. After struggling through a 1-9 season last year, in which they lost every game following an opening week 21-20 win over Glasgow — including four straight shutouts to close out the season — the Indians have renewed hope and optimism that the setbacks have made them stronger for this year. Townsend brings a 7-23 overall mark into his fourth season at the helm of the Indians’ gridiron program. Returning for the Indians this year includes a plethora of talented upperclassmen, while a handful of newcomers hope to help reverse the program’s recent misfortunes. Offensively, senior Jacob Anderson is back as a running back, as are juniors A.J. Bordeaux and Nicholas Angelo. Juniors Jodiah Morris and R.J. Rybicki will split time at fullback, while senior J.J. Killen returns at wide receiver. Along the front lines, senior Zachary Schultz leads a quartet that also features juniors Jaquan Floyd, T.J. Moore and Ramond Turner. Junior Ian Shaner is a newcomer to the Indians’ program, and will likely be the starting quarterback. Classmate Taion Knight will join the backfield group, and senior Kashad Waples will join Killen on the outside at receiver. Junior Will Curcio, sophomore Chris Cruz, freshman T.J. Burke and freshman Jack Williamson are all newcomers being counted on to provide depth, and possibly start, along the offensive and defensive lines. On the defensive side of the ball, Bordeaux, Angelo, Shaner, Waples and Knight will patrol the airways from their defensive backfield spots. Killen, Morris and Floyd will look to put pressure on the quarterback from their edge rush positions, while Schultz and Turner will work the interior line spots to stop the run. Moore will lead the linebacker corps. Townsend’s coaching staff consists of Joe Donnelly, Dave Grise, Bob Hahn, Sam O’Shields, Luke Long, John Cordeaux and Dan Kapp. The Indians will open their season Friday, Sept. 7, at home against Glasgow. Kickoff is scheduled for 7 p.m. They will also have home games this season with St. Mark’s (Sept. 21) and Lake Forest (Oct. 5). The annual Homecoming game will be against Laurel on Friday, Oct. 19, while Senior Night will take place versus Woodbridge on Friday, Nov. 2. All home games start at 7 p.m.